Elder Neil L. Andersen of the Quorum of the Twelve Apostles of The Church of Jesus Christ of Latter-day Saints will visit Australia and New Zealand this month. Accompanying Elder Andersen will be Elder L. Whitney Clayton of the Presidency of the Seventy. Watch an animated video featuring an excerpt of an address by Elder Andersen speaking to the youth of the Church. While in New Zealand and Australia Elder Andersen and Elder Clayton will be meeting with members of the Church’s Pacific Area Presidency, Elder O. Vincent Haleck, Elder Craig A. Cardon and Elder Ian S. Ardern, Church members, leaders and missionaries. Elder Andersen was named an apostle of The Church of Jesus Christ of Latter-day Saints on April 4, 2009. He was serving as the senior member of the Presidency of the Seventy prior to his calling to the Quorum of the Twelve. He was named a member of the First Quorum of the Seventy in April 1993, at age 41. He previously led the work of the Church in southern Brazil and, again as a member of an area presidency, oversaw the Church in western Europe. He has also assisted in supervising the work of the Church in Mexico and Central America. Elder Neil L. Andersen speaks during a Sunday session of the 183rd semiannual general conference of the Church on 6 October 2013.© 2018 by Intellectual Reserve, Inc. All rights reserved. 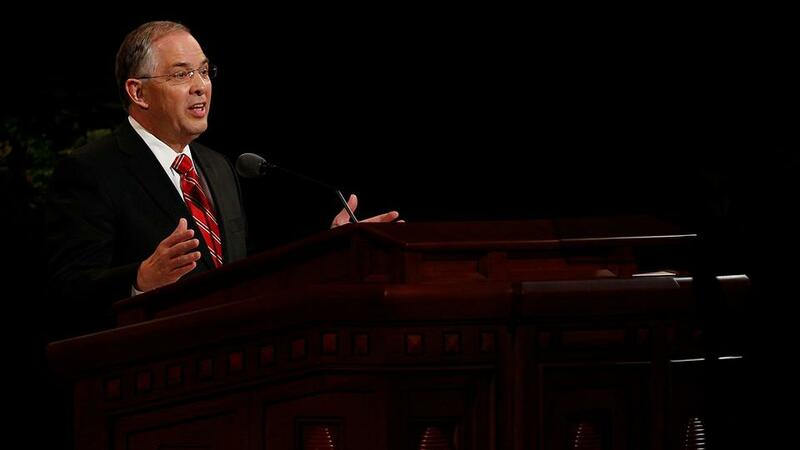 Prior to his Church service, Elder Andersen graduated from Brigham Young University, where he was a Hinckley Scholar, and earned a masters of business administration from Harvard University. After completing his education, he settled in Tampa, Florida, where his business interests included advertising, real estate development and health care. Elder Clayton was sustained as a General Authority Seventy of The Church of Jesus Christ of Latter-day Saints on March 31, 2001. He has served as a member of the Presidency of the Seventy since 2008 and was named Senior President of the Quorums of the Seventy on October 6, 2015. He assists President Dallin H. Oaks of the Church’s First Presidency and the Quorum of the Twelve Apostles in supervising the México Area and Elder Jeffrey R. Holland in supervising the Middle East/Africa North Area. Elder Clayton earned a bachelor’s degree in finance at the University of Utah and a law degree at the University of the Pacific. He was an attorney in California, USA, from 1978 to 2001. He and his wife, Kathy Ann Kipp Clayton, are the parents of seven children. Watch a video of Elder Clayton speaking to worldwide audiences during the Church’s recent General Conferences.